The call has gone out across the Sword Coast; the Ten Towns of Icewind Dale are paying handsomely for mercenaries, soldiers, and adventurers of all types to sail north and defend the port town of Targos from the encroaching goblinoid hordes. An unknown power is attempting to force the Ten Towns to bow to their will. It is up to you and your stalwart band of would-be heroes to find out who or what is behind this and stop them at all costs. Anyone familiar with the original Icewind Dale will start noticing significant changes in Icewind Dale II right away. The default screen resolution is now 800x600, with 1024x768 also being a supported option. IWD2 starts with an excellent introduction, similar in style to the one from IWD1. Without spoiling too much, I can tell you that you will play a mercenary/relief band from Luskan which travelled across the sea to the endangered city of Targos, which is where you will begin your adventures. Character creation in IWD2 still retains the features of the original, so you can create your entire 6-person party yourself, but also allows you to pick from one of 5 pre-made parties. Besides being a huge time saver (due to all the available 3rd edition D&D classes and customization, you could spend hours just making your perfect party), the pre-made parties are also well balanced and a great help to those not familiar with the rules, who now don't have to go through a long party-creation process but can jump right into the game. And the pre-made parties, as well as each individual character in them, come with a biography, so you don't start the game with the feeling of being a nobody with no history. Immediately after the introductory dialogue with the ship's captain upon docking in Targos, you will be greeted by a brand new game interface, which keeps most of the properties that we are used to from previous Infinity Engine games, but also sports some noticeable changes. Since the entire interface is now docked at the bottom of the screen, you get a bit more playing space, but if that still isn't enough for you, you can hide the interface completely. This has been implemented especially to my liking, since when in this mode, the interface is hidden most of the time, but when you pause the gameplay with the space bar, the interface will pop up automatically so you can issue the needed orders from the panel, and when you set the game back in motion, the interface will automatically hide itself again. The inventory screen has been altered as well. There you can now admire the larger version of the character's portrait, the animated avatar of your character, which functions as and replaces the paper doll, 24 regular item slots, the quiver, quick item slots and, most importantly, the quick weapon combos. To veterans of other IE games, this will feel like a welcome change. The only minor gripe I have with the new inventory screen is that shorter characters (dwarves, halflings, gnomes) look a bit lost in the huge globe surrounding them. 3rd edition D&D rules that the game uses have been implemented very well. The multitude of selectable skills and feats makes for very varied characters, and leveling up is not simply a routine, but an important event where you decide which additional skills and feats your characters would benefit from. "Annals of Halgren", the pre-made party I played with had a sorcerer that could finally use a crossbow! After Neverwinter Nights this might seem nothing special, but for anyone used to previous AD&D Infinity Engine games, this means much more - a totally different approach to tactics at the very least. Mages are not simply fragile porcelain that needs to be at the back of the party all the time, but can hold their own in battle. Ask my armour-clad sorcerer if you don't believe me. Dual wielding has also been implemented, and it looks very sweet in action. Combat and spell-casting remain largely the same as in other IE games, except for the special abilities which some of the characters (for example, monks) now possess, and general changes due to the shift to 3e rules. In terms of hack & slash vs. questing, I feel IWD2 puts a bit more emphasis on quests than the original did, though fighting is still a major part of the game. The Prologue that I have played through had a bunch of really interesting quests, and while some were of the pure Fed-Ex type, most were much more exciting than simple get-me-this-for-XP assignments. I should also mention a very clever way by which excessive walking around when solving quests has been addressed. Since the town of Targos where you start consists of 3 separate but connected maps, you can imagine there would be quite a bit of running around from one to the other if you were intent on doing all the quests, since many require you to go from map 1 to map 3, and report back to map 1. I, however, managed to persuade the town leaders to let me use the services of "Swift Thomas". Thomas is Targos' runner and knows all the shortcuts, so whenever I needed to go from map 1 to map 3, I simply had to talk to him and he would take the whole party there automatically. The same system worked for all 3 maps. I can only hope BIS implemented similar instant transport options in further chapters as well, because I love this elegant solution. Anyway, what I enjoyed the most during my time with the Preview copy of IWD2 (which only contains the Prologue part of the game) were the dialogues. Hats off to the people who wrote them, because some of the responses you can take are so ironic, sarcastic or just plain funny I nearly laughed myself to tears when I used them. Not to spoil too much, I've only included a couple such funny scenes in the screenshots, but they should give you an idea about what you can expect. For those of you who have played the original IWD, you will also recognize some returning characters early on, namely Oswald Fiddlebender, the gnome with the funky ship. I shook him down for 5gp he owed me as soon as I laid my eyes on him. As far as customization is concerned, IWD2 only expands on what we have come to expect from IE games. A number of new soundsets are included with the game, but also all the ones from the original IWD. Same goes for portraits - some made me almost sorry I had no fitting characters that could use them. The music, one of the hallmarks of the original IWD, is superb this time as well. While not composed by Jeremy Soule, Inon Zur did an excellent job by managing the capture the same epic feel that music in the original IWD gave to the whole game. By now you are probably expecting me to write about some negative experiences I've had with Icewind Dale II. To tell you the truth, I've had to think long and hard about what I did *not* like about it. Sure, some people who frown upon any game that is not 3D nowadays would have a field day saying that IWD2 cannot compare to Neverwinter Nights, for example. I cannot deny this, of course. The engine & the whole game looks just as good as it did with the Heart of Winter expansion, and spell animations are also largely the same. Some things have been transferred from Planescape: Torment (certain character/monster animations), some spell effects from Throne of Bhaal, and various improvements that ToB introduced are present in IWD2 as well. The graphics, however, bother me little, as I am not first and foremost concerned with the visual bells & whistles, but more with the feel of the game. And I like the feel of IWD2, without a doubt. Implementation of 3e rules has only helped matters, since I can now customize my characters much more extensively. IWD2 also runs incredibly smoothly on my Duron 750 with 256MB of RAM and a GeForce 2 MX... Something I could hardly claim for Neverwinter Nights. 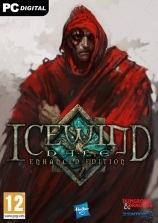 To conclude, I will say that anyone who liked the original Icewind Dale will not be able not to love the sequel as well. Anyone who hated the original Icewind Dale might find it a bit more quest & story-oriented from what I could see, so I dare recommend it to those as well, especially in light of all other engine improvements. The point is, with Icewind Dale II the Infinity Engine has reached its maximum potential - in terms of improvements, it can hardly get any better than this. If you haven't already, pre-order it now. You won't be disappointed. NOTE: For 67 more screenshots, click on the Page 2 link below. Keep in mind that some of them might contain slight spoilers.